Regular readers know I ride my bike regularly and I also consider walking to be one of the finest exercises. It is nice to see this documentation from the People Powered movement. I have written about the health benefits of walking and bicycle riding previously. Regular readers know that I rode my bike over 6000 miles last year. To read further, check out the following posts: Seniors walking, walking in general, bicycle riding. I consider walking to be the Cinderella of the exercise world, totally unappreciated. The People Powered Movement has issued a benchmark report on some fascinating aspects of walking and bicycling. • Bicycling and walking levels fell 66% between 1960 and 2009, while obesity levels increased by 156%. • Between 1966 and 2009, the number of children who bicycled or walked to school fell 75%, while the percentage of obese children rose 276%. • In general, states with the highest levels of bicycling and walking have the lowest levels of obesity, hypertension (high blood pressure), and diabetes and have the greatest percentage of adults who meet the recommended 30-plus minutes per day of physical activity. We could easily leave the car and walk on many errands, according to the report. 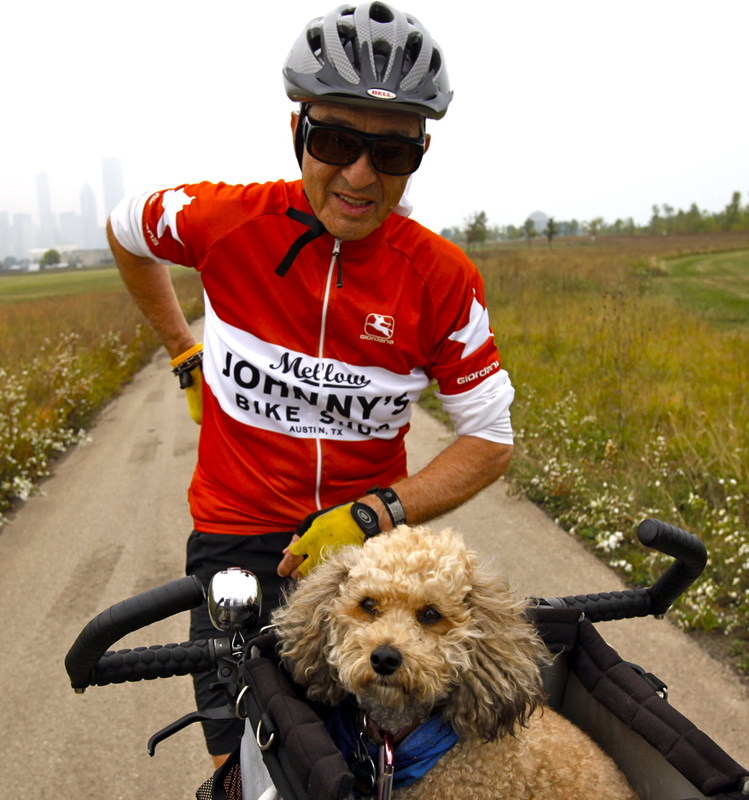 My dog and me in Chicago out on a bike ride. • In 2009, 40% of trips in the United States were shorter than 2 miles, yet Americans use their cars for 87% of trips 1 to 2 miles. Some 27% of trips are shorter than 1 mile, yet 62% of trips up to 1 mile long are by car. Residents of the largest U.S. cities are 1.7 times more likely to walk or bicycle to work than the national average. • 12% of all trips are by bicycle (1.0%) or foot (10.5%). • From 2000 to 2009, the number of commuters who bicycle to work increased by 57%. Some folks say they won’t ride a bike because it is not safe. But the study indicated otherwise. •14% of all traffic fatalities in the U.S. are bicyclists (1.8%) or pedestrians (11.7%). • In the 51 largest U.S. cities, 12.7% of trips are by foot and 1.1% are by bicycle, yet 26.9% of traffic fatalities are pedestrians and 3.1% are bicyclists. • Seniors are the most vulnerable bicyclists and pedestrians. Adults over 65 make up 10% of walking trips, yet comprise 19% of pedestrian fatalities and make up 6% of bicycling trips, yet account for and 10% of bicyclist fatalities. As a senior citizen who rides his bike almost daily, this bullet point was not fun for me to learn. I do believe that wearing a helmet and biking gloves would reduce those numbers. I love this Mark Twain quote. Please do consider walking more often and/or taking up bicycle riding. Each is a wonderful, very inexpensive way to get that much-needed daily exercise.